This is a tutorial authored by Grace Zarfati and compiled by XQDesigns. The design is what Maryam called Loop de Loop Ring. Different from other Rosetta ring, she made loops to make a band before making the rosette. She thought it wasn’t easy but with more practice she managed to do it. 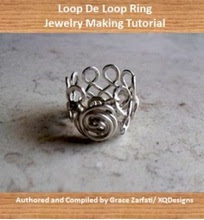 Follow the tutorial to make this ring for yourself too. The tutorial is suitable for students from beginner to intermediate level. The tutorial comes with detailed and clear step by step guides and pictures. Though it is designed for intermediate student, a beginner should be able to pick it up as well. Ever wonder how to get the bead inside a little wire basket? Seem impossible? Well, this lesson shows the tricks to place a bead within the cage. 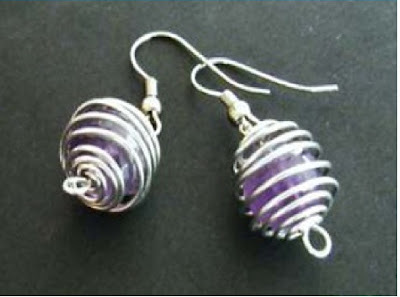 But mastering the skill, you can use it to form a earring, necklace or bracelet. This tutorial requires simple materials such as soft wire, ear wires and round beads. The tutorial contains 9 pages with 18 step by step guides. It is very easy to follow. It is suitable for beginners to intermediate level of students. 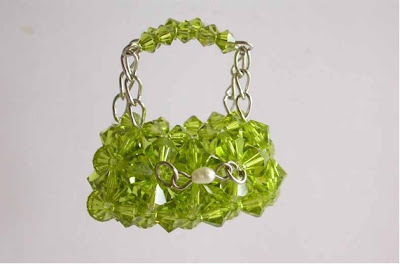 This is a not a bracelet, necklace but a simple and glamorous accessories. It requires only basic supplies such as jump rings and beads. You can use other colors beads as wished. It can be used as an accessory to hang on to your handbag to make it a unique piece. The tutorial comes with pictorial step by step guides. 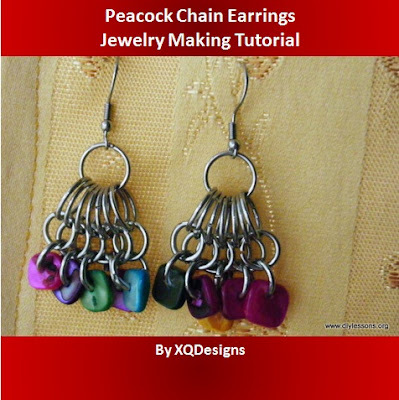 The tutorial is written by Hooi Meng and reviewed and edited by XQDesigns. Here’s a very simple and beginner tutorial for earrings. With colorful flat beads, dangling from little jump rings, we’ve named it Peacock Chain Earrings. In this tutorial by XQ Designs, you will learn the proper way how to open and close jump rings, and also learn how to attach or connect jump rings. Once you’ve learned the basics of opening and closing jump rings, you can use this technique in creating numerous chain or Chainmaille and different designs of jewelries.